We all know the Famicom/NES was huge in its prime period. Even though the wonders of the 8-bit generation are way behind us, kids from the 80s happily enjoyed countless hours of fun with games that are still fun to play today. The mainstream genres were pretty much covered with instantly recognizable classics, an affirmation that sadly cannot be applied to rail shooters. In reality, most people would say that the 8-bit hardware wasn't tailored to handle them at all. At least until you decide to expose them to Tetrastar - The Fighter. An impressive display of 8-bit processing marvel, Tetrastar is as smooth as it gets and comes filled with effects you wouldn't imagine possible at all on the NES. This excellence is also present in Cosmic Epsilon, another rail shooter released a few years back and co-developed by the same company that's just as good – and obscure – as this one. Even though they're easily the best rail shooters for the Famicom none of them came out of Japan, which is a shame. Button B is used to fire your main gun whereas button A is only active after you acquire at least one of the four special weapons. These are switched at the press of the SELECT button and consist of a "wide blaster" spread bomb (WID), an air-to-air homing missile (AAM), a napalm bomb that shakes the ground as it follows its fiery trail (NAP) and a chargeable bio-cannon (BIO). It's very important to take all the items that appear inside pink bubbles and stay on screen for a few seconds if you want to obtain additional ammo for their usage. Even though I didn't get to check that further, these icons might also provide some level of firepower upgrading. Moving around the screen and never staying put is, of course, rule number one in any rail shooter. However, Tetrastar is different in that most of the time you're given lots of room to move and dodge those spinning 8-shaped bullets. It is, in fact, one of the easiest rail shooters I have ever played, both on the account of the softer challenge and the high number of extends earned as you play (some huge stage completion bonuses totally engulf the extend routine). Granted, you'll still have to face tricky areas where deaths are almost unavoidable if you haven't memorized them yet, such as the spiralling drones in stage 3 or the huge spaceships that ram into you in stage 6. There are several reasons why I would recommend Tetrastar - The Fighter even to those who're not into this often neglected subgenre. Besides the great scrolling effects, the friendly difficulty and the involving storyline, there's also the outstanding diversity in gameplay. The game starts out epic enough as you need to defend New York from the alien invasion, but then it drifts into outer space, making you fly through blazing fast laser corridors and putting you against several alien fleets. 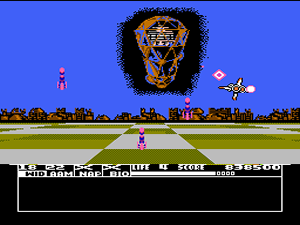 Hazards also include enemies scrolling sideways, quickly-shrinking blockades, energized barriers, vertical rockets and bosses with several protected cores. Boss destruction is particularly neat in that some of them fall apart as if collapsing into multiple energy bubbles. These are the only moments when the game shows some slowdown, or perhaps it's just there for cinematic purposes. In any case, this game needs to be seen it in motion. Static snapshots such as the one below don't do it justice. Wide blaster armed and ready! Tetrastar - The Fighter might not be that tough to beat, but it does pack an interesting scoring challenge. Each life in reserve is worth 140.000 points after you beat the final boss. Speaking of which, be warned that if the timer runs out in the final stage the game ends regardless of life stock. 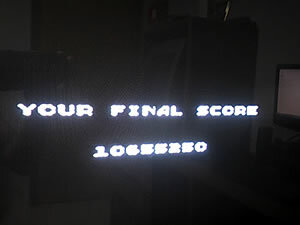 The good news on this is that in the final level you're given unlimited ammo for special weapons, so fire away those AACs and BIOs at will, if possible using a turbo controller for the AACs (there's no autofire at all in Tetrastar, so any kind of artificial autofire is definitely recommended). On the subject of special weapons, I rarely used the ground-based ones (WID and NAP) because I felt the ship's speed is enough to normally target most ground enemies. If there's an aspect that isn't on par with the rest of this charming little game, that's definitely the soundtrack. You'd normally expect a collection of sci-fi inspired tunes to go along with the action, but instead all you'll listen to are classic songs of public domain. There's nothing wrong with their renditions per se, but it's impossible not to be thrown off a little when the music reminds you of something like Parodius... I wonder if that was a conscious decision by the developer or if they just ran out of money to hire a proper composer. A nice debug feature (check it here) gives access to a sound test, a stage select option and a few other tweaks – that's how I knew the game actually has 7 stages broken down into several checkpoint segments. After the pilot (or pilots for the alternate ending) returns to Earth for a fireworks celebration over the New York city harbor the display for the final score appears for a few seconds only, so do your best to record it if you want to keep a historic memory of how well you performed in the game. Afterwards the screen halts in an ending panel and you need to reset the console to play again.